I’ve had my eye on this plane on Amazon for quite a while. All of my block planes are low angle, and for a standard angle plane, I decided to go a different direction from my usual Lie Nielsen selections and ordered one. Here are my initial impressions. The plane arrived nicely boxed. On removing the plane from the box, the fit and finish were immediately apparent. My first step was to remove the blade and begin preparing it. 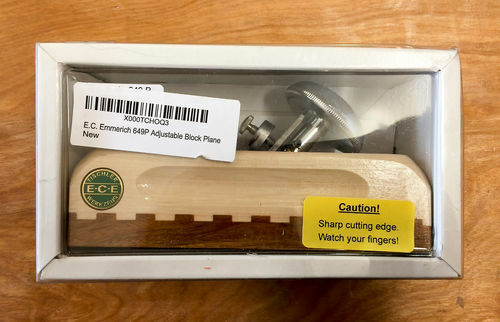 It was actually extremely sharp to begin with, but I didn’t bother to take any cuts with it, although I suspect it would be quite usable right out of the box. 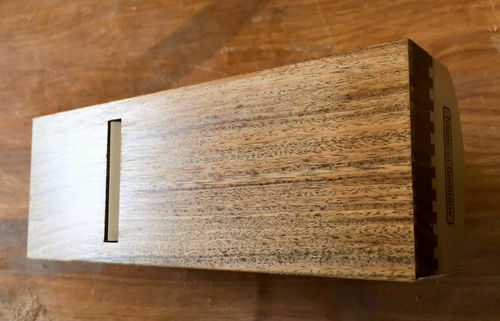 The blade is sharpened at a 25º angle, but since it is installed bevel-down, bedded at 45º, it is indeed a 45º plane. By comparison, a typical standard angle block plane is bedded at 20º and sharpened at 25º, giving the same 45º angle of cut, since that blade is installed bevel-up. I began by flattening the back of the blade (which is actually the front when it’s in use). It was quite flat to begin with, and just a few passes on the diamond stone had it looking great. Moving on to the bevel, it didn’t take long to get the face of the bevel flat, however the blade apparently was prepared at the factory with a double-bevel, because I did not achieve a burr (wire), and could see a thin, shiny line at the tip of the blade. A little more work on the stone soon gave me the burr I wanted, so I moved on up the grits, finishing with an extra couple of degrees (using the Veritas Mk II cam feature on the guide roller) on the 8000 grit stone. I finished it off with a back bevel using David Charlesworth’s ruler trick (more on that later). Returning the blade to the plane was easy, and it didn’t take long before I was getting some beautiful curls coming out of it. Like other block planes I own, there is no lateral adjustment for the blade, but some taps with a 4 oz brass hammer got even shavings coming out nicely. Actually, the open design makes it easy to get a clean tap on the sides of the blade, unlike low angle planes that take some careful aim. In just a half hour or so of tweaking and cutting, I had perfect shavings coming out of it. Also, the lignum vitae sole plate was doing its thing and getting nicely polished and the self-lubricating properties were apparent. Just to note, checking on The Wood Database, this appears to be Argentine Lignum Vitae, also known as Verawood. It’s lighter in color, but clearly possesses the same property of self-lubrication. The adjustment knob doubles as a palm rest and is very comfortable. The backlash is very respectable at 1/2 turn. The specs are: approximately 6” long (it’s metric), 2” wide and the blade is 39mm, or just over 1-1/2”. It weighs in at a very comfortable 14.6 oz (compared to 26 oz for my LN rabbeting block plane, and 17 oz for my LN 102). It is not flimsy by any means though. 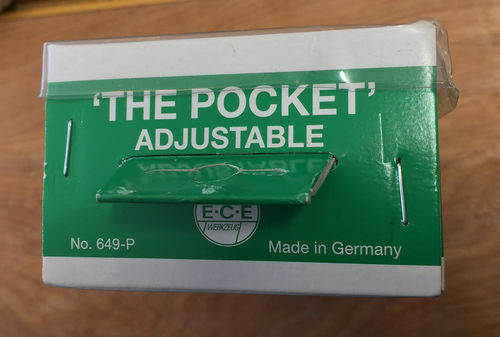 The German craftsmanship really shows in every detail. A quick note on the ruler trick. I actually found that a 1/2” strip from one of those thin, flexible kitchen cutting mats does great in place of the ruler. It sticks nicely to the stone, and the blade slides smoothly on it. Just for reference, the strip I am using is 0.025” thick. To sum things up, it is a great little plane at a good price point (around $95). It adjusts beautifully and feels great in the hand during use. I think I’m going to enjoy using it for a long time to come. Thank you for a thorough and well written review. Have often wondered if these are any good but newer been able to find anyone actualy having tryed them. Much apreciated! They are beautiful and there is nothing like a wood plane. 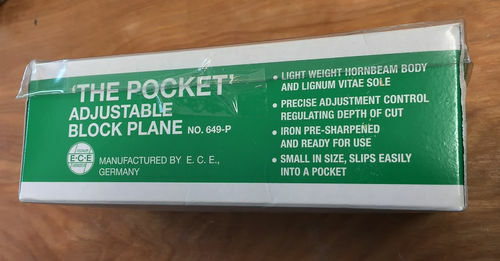 I’ve used this brand of planes for many years. I love the way they feel in my hands, and they do a great job. Glad someone else found them and like them. I own 5 ECE/Primus planes. A smooth, a scrub, a rabbit, a jack and a jointer, I have absolutely no complaints about them. They perform outstandingly well. -- "what a ya mean I don't believe in god, I talk to him every day.” Dave Mustiane. I have the primus jack and after I got used to the unusual setup I like it a lot. It’s my go-to roughing plane. I just re-flattened the sole for the first time today, it was very slightly concave along the length. Now it works even better. Mine has a hornbeam sole, and I find it does need to be waxed. Maybe a lignum sole would be better.